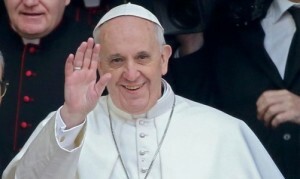 WILLEMSTAD – A Curaçao delegation will invite Pope Francis to come to the island. That was announced by the Diocese of Willemstad recently. This invitation will be personally conveyed by the Prime Minister of Curaçao, Ivar Asjes on September 16 of this year. The Premier will be in Rome together with Bishop Luis Secco and Pastor Curtis Meris for a climate conference. The last pope who visited Curaçao was Pope John Paul II. Exactly 25 years ago, in 1990, the prelate made a stopover of 7 hours on the island. He was then received by the former Prime Minister of the Netherlands Antilles, Maria Liberia Peters.